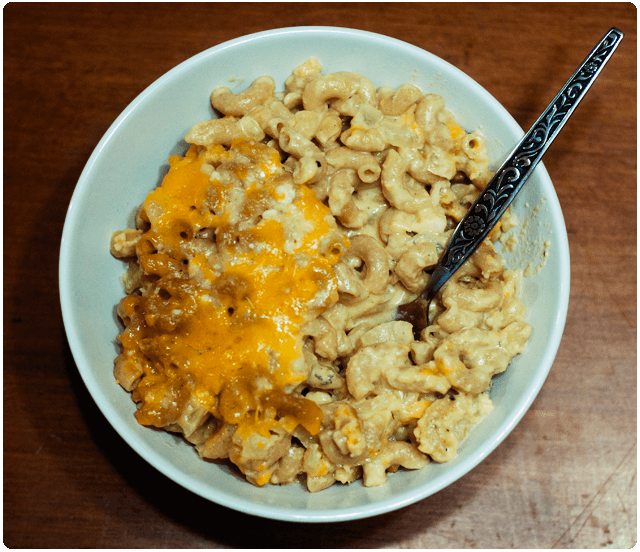 This is a super delicious macaroni and very creamy! If you have leftovers, you can toss in some frozen peas, chopped fresh basil, and a chopped tomato to bulk it up the next day! Preheat oven to 350ºF. Coat a 9×13 casserole dish with cooking spray. Cook your macaroni in a LOTTTTT of boiling, super salty water for 7 minutes. No more than that or you will end up with mushy macaroni in your final dish. Melt butter in a medium saucepan over medium-low heat. Slowly add flour, stirring constantly with a whisk, cook for about 3 minutes. That’s our roux which will thicken the sauce. Slowly whisk in milk to thoroughly incorporate flour mixture. Stir in onion, garlic, and bay leaves. Simmer for 15 minutes, stirring frequently; remove from heat. 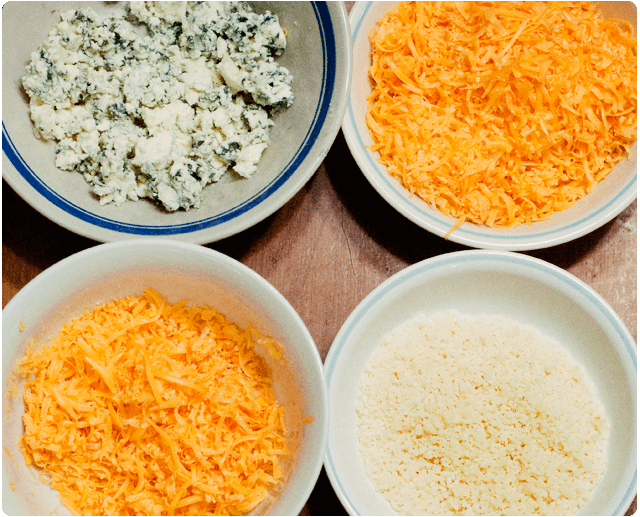 Combine blue cheese with about two-thirds of both types of cheddar cheese in saucepan and season to taste with salt and pepper; stir in macaroni. Pour macaroni mixture into prepared dish and sprinkle with remaining cheddar cheeses and the parmesan. Bake for 25 minutes. Let stand for about 10 minutes before slicing into 8 pieces. Yields 1 piece / cup per serving. So freaking delicious, filling, and overall it was fairly quick to make. Everyone loved it, even Sir Nummies! I’m putting this on my list of recipes to make in the near future. Your shrimp/pesto/pea pasta is on the menu for this week! PS: LOVE the February design! OH yes, I am all about frozen peas in just about everything. It’s just SO easy to add, taste good, and bulk anything up for barely any calories. Which is why so many recipes lately have them LOL! That looks absolutely delicious! Thanks for sharing this recipe, it’s definitely something I’m trying ASAP!! Thank you! It’s super tasty and although it has blue cheese in it, it’s not SUPER strong to make it blue-cheesy… if that makes sense lol. I love the idea of the blue cheese! I think it’s an awesome touch, that probably adds a lot of flavor without being too overpowering. HAHA!! Thank you!! It’s not one of my more frugal dishes because of the types of cheese, but for a cheesy splurge every once in a while, it’s not so bad!